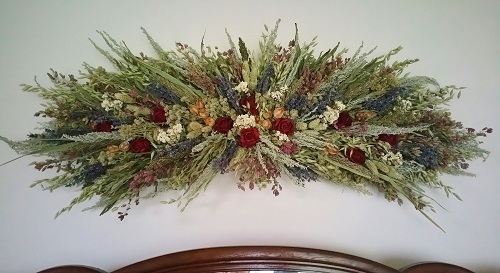 This beautiful herbal swag is crafted of fragrant lavender, roses, rice flower, and pearly everlastings are all carefully tucked into a base hand-crafted of grasses, artemesia, sage, meadow mint and santa cruz oregano. Swag shown is 36". I went and picked up the wreaths at the post office today. They are FABULOUS!!!! I know it must sound rather corny but they took my breath away when i peeled back the paper and saw them. You do absolutely amazing work! I know my friends will be equally impressed and will enjoy them for a long time to come. I really dont have the words to thank you enough and to tell you how gorgeous they are. I will definitely recommend you to anyone that is interested in purchasing arrangements and you can be sure you will have my business in the future. Again, thank you so very very much!!!!!! !